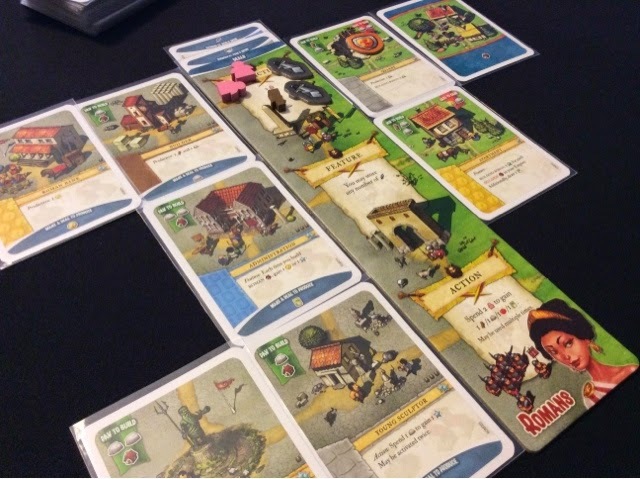 Well, I mentioned in my initial impressions post for Imperial Settlers that I would be having a second crack at the game over the weekend, and I did! Not only did I managed to get my second game in, I also managed to get in 2 solo plays on a very dull Sunday night. I'll start with the very short 2nd impressions and then on to the solo impressions. For my second play, I headed the Roman Empire instead and seeing it was a 3 player game, I purposely left out the Japanese faction. To get the scores out of the way, the end points were 57/55/47. I came in second to the barbarian faction (2 wins out of 2). The Egyptians were dead last again (2 last out of 2). Am I implying anything? No. Just info for those who would like to know. Anyway, I much rather enjoyed my second play of the game. Not because I was actually competitive this time round, but this time I got to see some synergies in the game as I actually managed to get some decent production buildings from the get go. This really helped to provide resources that allowed me to manage a somewhat decent engine and to let me actually plan what I wanted to do instead of just doing what I could do with what I had (or didn't have - which is what my first game felt like). I decided to go all warmonger at the beginning since I was the Romans and that actually went ok. Until the barbarians discarded my sword deals and took off on their own barbaric warmongering ways. Then I settled down and shifted my strategy to building and chaining cards that gave me more points for certain types of buildings or for cheap resource conversion. On this play through, I could see the same problems that I encountered when I took the Egyptian faction. My poor friend likewise drew no production cards early on and really stumbled out of the gates. Only nearer the end did he managed to string together a pretty decent victory point engine but I would say he was maybe a round or two too late. He stayed at 10-15 points by the end of round 3. But by end of the game he had 47, so given maybe another round or two he might have bested us. So is there any new or changed conclusions from my second play through? Well mostly yes. I did enjoy the game much more this time around. I felt like I was actually playing rather than managing. So that was great, it's no longer an ok game, I would confidently say that it is good. I still enjoy the resource balancing portion of the game and I like how some cards let you pull off nice chains and slick combos. However, the thing that hasn't changed for me is the luck of the draw. 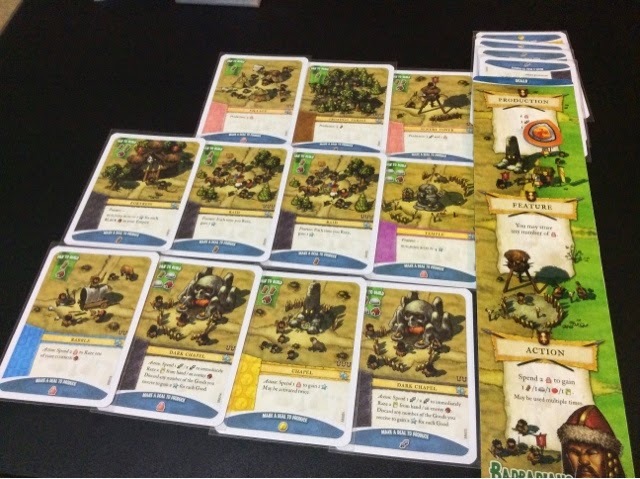 I feel that luck plays a huge huge part in imperial settlers. Starting with poor or no production cards is a big big setback. Also, some cards are definitely the main gist of a faction's deck, and not getting it in your game would render your faction much less powerful than it could potentially be. For example, for the barbarians, you would hope to have at least the dark chapel or the raid card appear in your game. Failing which, I think your points engine wouldn't be as ideal as you would want it to be. Of course, I could be wrong, so don't take my word for it, just gotta try it out yourself. Another thing I disliked was that there isn't enough variety in the card abilities. A lot of the points generating cards revolve around "change 1 person and 1 resource for 2 points" or "change 1 person and 2 resources for 3 points". They are same in function and only different in cost. I guess it makes them different still in theory, but having further differing abilities like say sacrificing victory points to raze an opponents faction building would be nice, or to use resources to make your shielded building unrazable for this round. You know, like, using other stuff I have to potentially do something that I normally can't. Yeah, it was kinda sad when I saw that my building was only barely different from my opponent's building ability wise. Lastly, and this is just a small thought, I think whoever draws a faction card that provides a sword under the deal section early will be in a good position to control the flow of the game. I've often found that making the sword deal is one of the most fruitful and important decision in the game. Attacking early and often gives you more stuff and denies your opponent the chance to benefit from their hard built building. In both our games so far, that has certainly been the case. This is something I will like to explore more but that's been the trend on my two games so far. 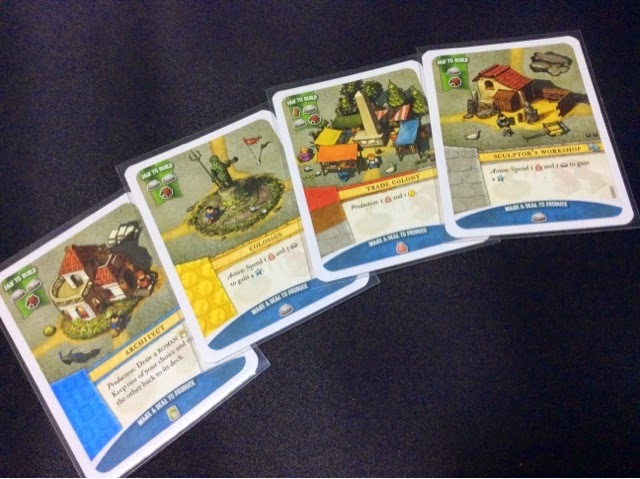 So that's it, second impression of imperial settlers. 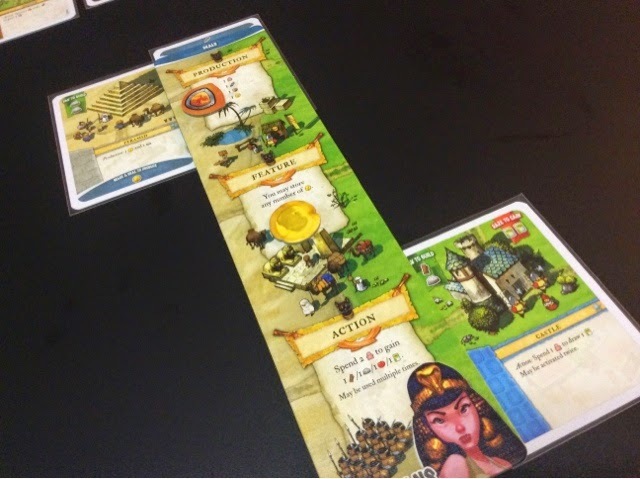 New factions is a must for the longevity and heightened gameplay experience of imperial settlers. Anyway, next up is a rough overview of my 2 solo plays of same said game. 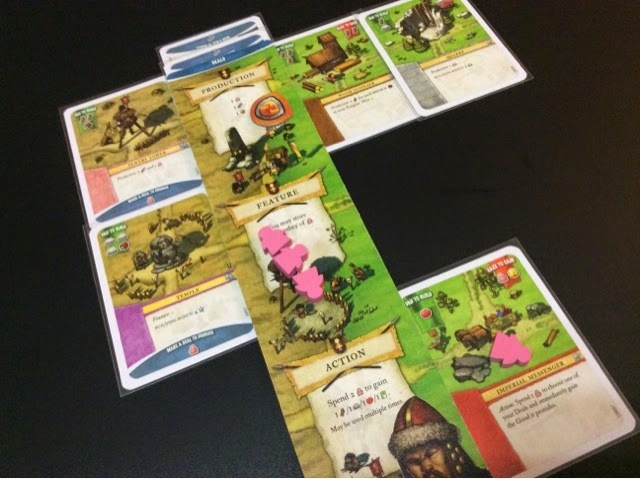 The solo game likewise involves you the player building up your civilization. This time however, you are facing threats from the virtual enemy, whereby after executing the same 4 phases per round, an enemy attack card is flipped to reveal what type of building it is going to raze from your tableau. How the building is determined is by the combination of symbols between the newest attack card and the order of the subsequent prior attack cards played before it. As long as any of your common buildings have the matching symbol icons in its raze box location, the enemy will raze those buildings (to the maximum of one). There is a tiebreaker rule to let you know which building will be razed first (usually by type then by building conditions). There are 2 aims to the solo game - outnumber the enemy, then score the most victory points. If you score a multitude of victory points, but your total number of buildings is equal to or less than those of the enemy, you have lost regardless. But if your number of buildings outnumber the enemy, you count up your points and obtain a title based on how high your score is. Each turn, if you leave the enemy to its means, it will always score 2 buildings into its collection. So if you don't raze anything, by game end, the enemy will have a minimum of 10 buildings in its tableau. Each building it razes from you, it also adds to it's collection. So you have to manage it to a point whereby you are building faster than the enemy is collecting. Simple enough. And really I'm sorry to say that it is just too darn simple. I played 2 solo games and completely outnumbered the enemy. It wasn't even close. I never once felt like I couldn't meet the conditions to get my score tabulated and a title earned. My first game involved me taking the barbarians. The enemy ended with 1 building, and I with 11. My final score was 56 (title obtained: knight). It was my first time using the barbarians and I went nuts razing everything he enemy owned to the ground. I managed early sword productions and deals and combined with the dark chapel and raids, it was a no brainer. Raze and raze often, score as and when possible. 56 is not that high a score, but I was surprised at how easy it was to defeat the enemy. I didn't lose a single building to its attack. My second game was played with the Egyptians, I just had to see them turn the tide and score a nice fat victory. And a fat victory it was, I ended with 13 buildings compared to the enemy's 3. Final score was 64 (title obtained: castellan). 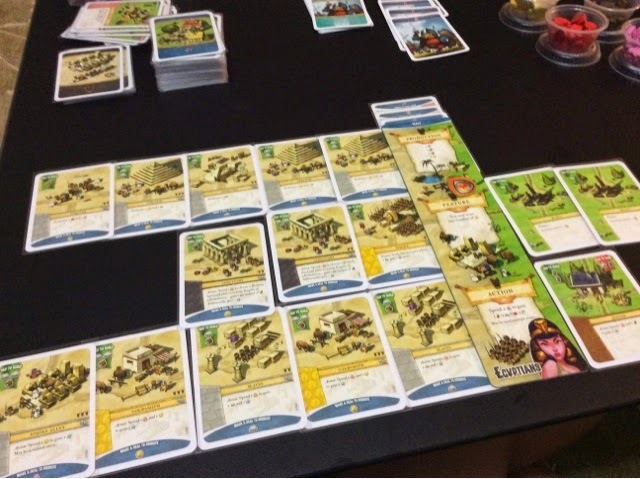 When I played as the Egyptians, I started really slowly. Again I drew stupid action buildings that I couldn't use (I think my Egyptian deck is stacked. Haha). But eventually I got down to the same sword production strategy and it worked like a charm. The sphinx is super important to the Egyptian points engine and I used it to quite a good effect. I was actually surprised I out scored my barbarian score. After all it didn't look that great at the beginning. So, how is the solo play? Well, it was disappointing to be able to so easily defeat the enemy. That is the main downer of the solo play. I would have hoped to at least feel like I wasn't going to make it. But the resistance was laughable. So that was terrible. As for gameplay, I think it manages to give you the same feeling of building your civilization as per the base game, only that it's like playing the peaceful variant. No one there to mess wih your plans or irritate the hell out of you. While at the same time you can raze the helpless enemy for goods and to satisfy your blood lust. The solo game is also quick and allows you to get a feel of the faction's combos and power cards. So you can use it to level up your game so to speak. But in the end, it becomes a game of trying to score higher than you previously did, and if you are ok with that, then it should be a good fit for you. But for me, that is not enough. When I play solo, I like to know that I have the possibility of losing (Robinson Crusoe, Friday, Run fight or die). If I'm certainly going to win, and all I'm doing is trying to best my previous score, that's just not for me. I don't like to go on ego trips. I want to know that I am fighting a system that is smart. Or at least of considerable quality. One additional small quibble that is probably just me and not the game. During the lookout phase when you are choosing faction cards, you draw four, choose one, and then randomly shuffle the remaining three to give the enemy one before you pick one from two and the last goes to the enemy. Ok, so you know all the cards on the table and you know there are two that you particularly want. Its VERY difficult for me to shuffle three cards when I kinda know which one I really don't want to give to the enemy. Its like, mentally you always take note how you shuffle the 3 cards and at any point in time where the card you want is. I don't think its the cheating mentality in me, but really, shuffling 3 cards and trying to completely wipe away any notion that you don't know where the card you want is is difficult. So I threw them under the table and rough them up before shuffling. Small thing, but highly annoying. Which is why I am probably unlikely to play the solo game again. If I do it's only cos I want to check out the Japanese faction which I have yet to get a chance to control. But apart from that, I would rather play Robinson Crusoe or just chill with a book and a nice bottle of cider. Roll a die if you cannot be honest with yourself on a 3 card shuffle. Sheesh. Have u played 51st state/The New Era by the same designer? How do u compare the 2 games? How could you possibly have that many civ buildings after only two rounds in your Roman game? Either I'm missing something with the rules or you are, because that's a lot of resources and discarded common buildings (plus their initial cost). Not to mention the card draw to even have that many cards to play.